Editor's Note: This is the third of seven blogs from our friends at the Right Question Institute (RQI) and the teachers that have utlized their methods and strategies. You can read the introduction and overview of the series here. This piece will take you through two teachers' experience from identifying the need, to the steps taken to implement, specific strategies used, and student reaction to the RQI method. Project Based Learning (PBL), Cultures of Thinking, Thinking Maps, Genius Hour, Maker Space. Current trends in education may sometimes leave educators feeling overwhelmed. You see other teachers’ blog posts, Instagram feeds, and Pinterest-worthy classrooms and can’t help but feel that you have to do it all, too. This internal push-pull can leave you feeling defeated at times, struggling with how to incorporate all these great ideas within the time constraints of a school day. As educators, we can’t do it all, but we can do what we think is best for students by adapting a few new ideas in a way that is most comfortable for us. Luckily, our school district and building principal encourage us to try new things and share our successes and failures so we can all learn from one another. We are first-grade teammates in a diverse school in Novi, Michigan. There are 32 home languages spoken by our students, and about 47 percent of our students are English learners (EL) who are actively receiving English as a second language (ESL) instruction. We have another 14 percent who are formerly limited English speaking. With such a diverse student population, we aim to incorporate language objectives in everything we do. At the end of the year last year, while reflecting on our classes, the professional development (PD) we’d attended and books we’d read, we talked about what really mattered to us as educators. No matter what we were discussing, one thing kept coming up repeatedly: We wanted our students to think, and to think deeply. We wanted them to be curious. We wanted students to take control of their own learning and be engaged. We knew we had our work cut out for us to achieve all this in a first grade classroom while meeting the needs of our ESL students, but we knew it was important. It wasn’t until we attended a PD about questioning in the classroom that we understood how we could get our students to ask meaningful questions to drive their own learning. The main idea of this session was to increase and change the types of questions we as teachers ask our students. Something the presenter said, however, struck a chord with us: Children hit their question-asking peak by age 4. Once they enter school, questioning dramatically decreases. This made us think that it had to go beyond just teachers increasing their questions; we had to get our students to do the same. That’s when we found the Question Formulation Technique (QFT) from the Right Question Institute. We soon realized that this was not only the start of getting our students to think and question, but was also the solution to using some of the other exciting ideas and methods and actually fitting them into our day! Our students are inherently curious. We just needed to spark our students’ curiosity so they would be ready to ask and answer their own questions. We used the workshop model to gradually introduce the QFT. We spent several days on each step of the process to ensure our students were ready before we moved on. Throughout the QFT steps, we used various Thinking Maps and Cultures of Thinking routines as scaffolds for our early learners and our ELs. This is challenging for first-graders, but the workshop model was essential to the success in our classrooms. Use quotes from picture books, e.g., “This tree is a tree of miracles,” from The Great Kapok Tree, or an illustration from a wordless picture book, like the eye in the cornfield from Unspoken. Engage students in groups or partnerships like a Think Pair Share to create questions about the QFocus. Record students’ questions on a Circle Map or chart paper to save time. Provide questioning stems to help students formulate their questions. Have students record their questions on sticky notes and add them to chart paper or use Padlet, an online tool. 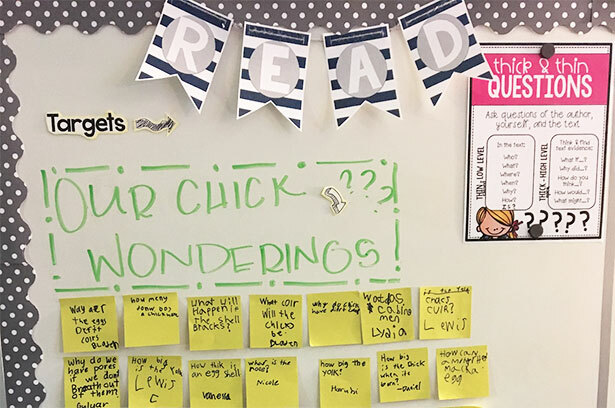 Share out by reading the sticky notes aloud, having students read their sticky notes aloud, or by doing a thinking routine called a Chalk Talk. Sort previously created questions as a whole group first. Use a Tree Map to classify questions as open or closed. Have students vote on the top three questions they felt were most important, or the questions they wanted to find answers to first, to prioritize them; keep other questions visible so early finishers have more to explore. Lead students through reading and research by modeling how to find answers within a text or on the computer. Show students how to take notes by using their own words and transfer into paragraphs. Once we led students through this guided QFT process, it was time for students to use the QFT protocol independently. We knew our challenge: We needed to figure out how we could facilitate learning experiences where students turn their curiosity into meaningful questions and answers. Our EL students with a limited English vocabulary were another aspect to consider. It was clear that in order to get our students to continually generate meaningful questions and pursue meaningful answers, we would need to create a culture where questioning was embedded, expected, and explicitly taught. We were intentional in the way we established a questioning community from day one. Our hope was that no matter the subject or the task, questioning would be everywhere. Within the first few weeks of school, we introduced the Wonder Wall. 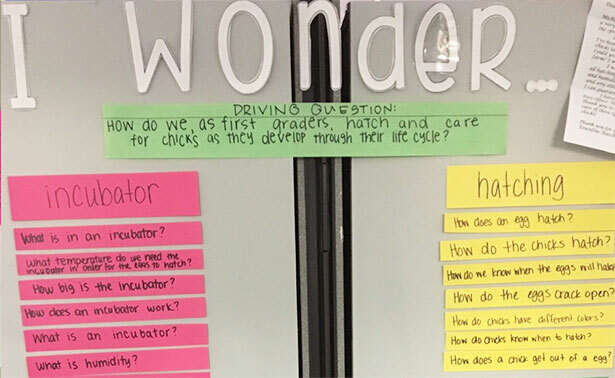 Our Wonder Wall acts as a “parking lot” where students can post questions they're curious about. For example, when we began learning about the past in social studies, students began asking questions like, “Why was there only one room in a school?” and, “What would it be like if we had to go to school with only people who looked like me?” When we began to learn about weather in science, our students asked questions such as, “How does a hurricane form?” and, “What makes lightning?” The best part was when students had similar questions, because it helped us notice what our students were really interested in learning and target instruction accordingly. Our only requirement at this time was that students asked questions, not provide statements (which is surprisingly hard for first-graders!). Then, we chose a few questions from the wall to discuss each week. As a class, we talked about how the questions helped us learn more about the topic and we pointed out the structure of the questions. Our emphasis was on the questions they were asking, not the answers. Wonder Bubbles were introduced immediately after we introduced the QFT protocol. All of this was done during our reading and writing blocks. Students chose any QFocus they were curious about. Students used their QFocus to work through steps one through five of the protocol with little assistance. With our help, students answered their priority questions by using books, articles, and kid-friendly search engines like Kiddle.co. This was exciting to watch because our students were so engaged, empowered by choice, and eager to implement all we had just taught them using the QFT. Their final products were called Wonder Bubbles and were presented to their third-grade buddies to teach them all about their QFocus! Each Wednesday for morning work, we utilized the website Wonderopolis to pose a “Wonder of the Day.” Students respond to the Wonder by either asking more questions or trying to answer the question. The idea here was to expose students to questioning words and structures and to get them comfortable taking risks by sharing their thoughts. This was especially helpful for our ELs because most of our students felt more comfortable asking questions about the Wonder of the Day. This gave our ELs confidence to ask questions and, in turn, created the mentality that it’s okay to not know the answers. Before reading the answer to the Wonder, we gathered as a class and students shared their predictions. Exploration Hour was something we introduced before we began teaching the QFT protocol. It combines the ideas from Maker Space and Genius Hour by centering around our students’ passions. Each Friday we set aside about an hour of class time for Exploration Hour. Sometimes we would pose a question or a challenge and students had to work together to find a solution. Other times, students explored their own questions from the Wonder Wall. They asked to do this so much more after we began teaching our students the importance of asking questions through the QFT. This is when we realized we had succeeded in creating curious, passionate, first-graders! We began our first PBL unit later on in the school year after we finished teaching our kids the QFT and they had ample practice asking and answering questions on their own. The QFT made PBL much less overwhelming. At this point, students already saw questioning as a part of our classroom culture, so the transition to PBL was much smoother. Students could now easily generate our “need to knows,” which enabled them to drive their own learning through our PBL unit. We integrated our PBL unit with our animal life unit in science and finished our informational writing unit using the PBL’s need to knows. After posing our PBL’s driving question, which served as the QFocus, students created and prioritized their questions by grouping them into categories. Students worked in groups to research their questions, and we also made sure to have a place where students could pose more questions as they learned. Our students were able to do this on our “Chick Wonderings” Wonder Wall and on our class Padlet. We watched as our students took control over their learning and continued to ask and answer their own questions. After using the QFT protocol, we asked some of our students about the process. We loved hearing their ideas! Why is it important to show or explain our thinking? Lucy: Because getting the right answer is not as important as how you got the answer. Shanu: Because like in math, the answer is only part of it. If you don’t show your work no one else knows how you got it. Sanchi: So everyone knows how we got our answers. Deepak: So people get a picture about what is going on in my head. No one can read my mind, and you always say “because I knew it” is not good enough. Daniel: Because maybe other people think something different and then we can hear new ideas. Ayaka: Because we learn more when we have to think about the answer and not just tell you what we think is right. Why do you think we ask questions? Lucy: So we can understand what we’re learning about. Shanu: To find the answers to things we wonder about. Deepak: Because then we learn more about something, and it can be what we want to know. Daniel: So we can see what everyone is wondering, and sometimes it’s the same thing as you! Ayaka: So we can be curious about what we are learning and want to know more. 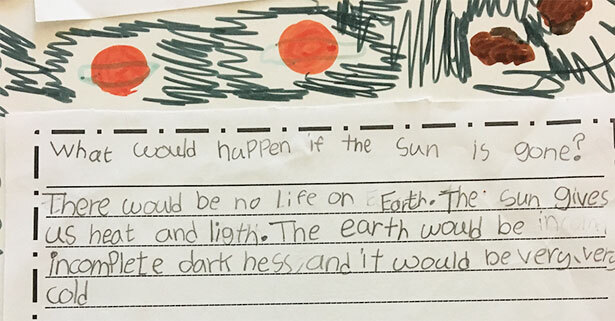 While we certainly do have to make adjustments to our day to incorporate PBL or Exploration Hour, everything else mentioned fit seamlessly with our first grade standards. We adjusted our curriculum for what we felt was best for our students. Without a doubt, incorporating the QFT protocol made all of what we accomplished feasible. No matter the makeup of your classroom or the grade level you teach, it is possible to get your students to think deeply and ask questions that drive their learning. Now that questioning has become an integral part of our classroom culture and teaching style, we are anxious to continue to find more ways to inspire student inquiry. We felt that questioning made a difference in what we did, and our students’ transformations validated our work and time investment. We can’t wait to hear how other elementary teachers implement this in their classrooms as well! Ashleigh Burry is a first-grade teacher in Novi, Michigan. She has been teaching for 12 years with experience teaching fifth grade, literacy, and first grade. She holds a master’s degree in curriculum and teaching from Michigan State University. In addition to questioning, Burry has a passion for literacy and finding books that foster a love of reading in her students. She lives with her husband, a fellow teacher, and twin 6-year-old boys. Connect with Ashleigh on Twitter: @arburry. Kristy Mandel has been a first-grade teacher in Novi, Michigan, for four years. She attended Michigan State University for both undergraduate and graduate education, recently receiving a master’s degree in teaching and curriculum. She has a passion for teaching and strives to foster a love of learning in her students. Mandel recently celebrated one year of marriage with her husband, Jake. Kristy and Ashleigh would like to extend their gratitude toward their other first grade teammates for helping them try out and plan for the QFT in all of their classrooms! You can follow Burry and Mandel on their shared Instagram account, TalesofAverage.